IS LA VIE EN ROSE OVER FOR FRANCE? METZ, FRANCE – The dramatic seaborne rescue of 328,000 Allied troops from Dunkirk in June, 1940 is well known. But the tragic effort of almost 300,000 French troops to break out of encirclement in eastern France along the Maginot Line is almost totally unknown. On 10 May, 1940, Germany unleashed a new form of mobile warfare known as “blitzkrieg” against the combined armies of France, Britain, Holland and Belgium. At the time, France had Europe’s most powerful, battle-hardened army with more tanks, artillery and warplanes than Germany possessed. France and her British allies were prepared to re-fight the same static battles of World War I that had ended only 22 years earlier. By contrast, the rebuilt German armed forces were determined to fight a fluid war of movement to avoid the terrible slaughter of World War I. Chancellor Adolf Hitler rejected the more conventional campaign plans proposed by his generals, choosing instead a daring, radical plan, “Fall Gelb,” drawn up by the brilliant Gen. Eric von Manstein. This audacious proposal called for the bulk of Germany’s armor, mechanized and logistical units to negotiate the dirt tracks, ravines and dense woods of the vast Ardennes Forest that straddles the Franco-Belgian border and Luxembourg. The Germans would then fall upon the hinge of two massive French armies (north on the Belgian border and south behind the Maginot Line facing Belgium and Germany), then drive northwest for the Channel, so isolating the Allied armies corps in northern France. The Germans chose not to attack the principal fortification of the Maginot Line which was built to cover France’s coal and steel complex in Lorraine. The French knew the Maginot Line’s left flank opposite Belgium was weak and vulnerable. The 1930’s Depression had almost halted work on the Line, which was begun in the late 1920’s, leaving it unfinished and undergunned. As a result, the French Army stationed some of its best regular divisions around Stenay to protect the Line’s vulnerable right flank. Popular belief holds that the French High Command believed that crossing the Ardennes in force was impossible. Not so. In 1938, the French army had run war games around Sedan on the Meuse River with just such a threat in mind. But the French fatally overestimated the time it would take the Germans to transit the Ardennes and reach the Meuse. The French Army would have had ample time to concentrate on any possible crossing of the Meuse, it was believed. But in 1938, a French parliamentary deputy, warned of the threat of a German breakthrough in the Ardennes-Sedan region. This is, of course, precisely what happened. In one of military history’s most audacious feats, German mechanized forces crossed the Meuse, shattered weak French defenses there, and raced for the Channel, cutting off the British Expeditionary Force and France’s armies in the north that were poised to invade Germany’s Ruhr industrial region. The Dunkirk disaster ensued. Hitler’s foolish hopes of a German-British alliance saved the British forces at Dunkirk from total destruction. Germany’s racing Panzer divisions and their close air support then drove south, sweeping aside French divisions, and taking Paris on 14 June, 1940. The German advanced across northern France and then down the Rhone Valley. More than 300,000 French mobile and “interval” troops with large numbers of heavy artillery were deployed to defend the Maginot Line. 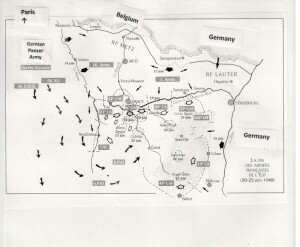 But as these formations were increasingly threatened by the rapid southward movement of German forces on their rear and across their lines of communication, France’s high command was faced with the terrible choice of seeing these armies cut off and destroyed or abandoning the mighty Maginot Line, the pride of French military technology and national pride. In mid-June, 1940, the decision was made to begin pulling the interval forces and many garrisons out of the Maginot Line. These units were ordered to retreat to Central France, abandoning Alsace and Lorraine to the Germans. The retreat would become a Calvary. Most of the units of the 11 army corps drawn from the 2nd, 3rd,5th and 8th French armies lacked their own organic motor transport – meaning they would have to walk. Most tragic was the plight of the fortress regiments numbering 220,000 men. They were trained as gunners and machine-gunners, not infantry. Their weapons were fixed in casemates and major fortresses. Most of the fortress troops had only pistols and a few automatic rifles. All of the French Army’s 75, 105 and 155mm artillery had to be abandoned because there were no tractors to pull them. On 15 June, six German divisions fought their way across the Rhine River into France in spite of intense resistance from French fortifications. This was the largest amphibious operation on the Western Front until D-Day. At the same time, German units pierced the gaps in the Maginot Line and its flanks left by the retreating French interval troops and appeared on the rear of the Line’s forts with their powerful PAK37 and 88 guns. Soon after, Fascist Italy attacked the south of France. However. This assault was smashed by the southern arm of the Maginot Line. France’s High Command ordered the by now isolated Maginot garrisons(or “crews”) to sabotage their fortifications and retreat. Some crews did, but others refused to retreat or surrender. The large forts kept firing a blizzard of high-explosive shells at advancing German units, inflicting serious casualties on the enemy. The fort of Brehain, for example fired 24,250 high explosive shells; the mighty Simserhof fort fired 17,000. German assault troops managed to take three small works and many feeble blockhouses, but no major Maginot fort was captured or even seriously assaulted. By 17 June, the renowned German cavalry general, Heinz Guderian, had raced his panzer army south down the Meuse to Belfort near the Swiss border, trapping nearly 300,000 French troops in a giant pocket between the Meuse and the Maginot Line. All of these units and the retreating Maginot troops eventually surrendered 21-25 June. A few Maginot forts held out until repeatedly ordered to surrender by the French High Command. The Germans chivalrously allowed their garrisons to leave their forts with banners flying and under arms. Military doctrine and technology of 1940 and met and crushed the military of 1918. But another power, the Soviet Union, would soon defeat Germany, using the same devastating combination of fire and movement, but this time with massively overwhelming forces. Why are we never taught this? Why is America allowed to tell its lies about the french?